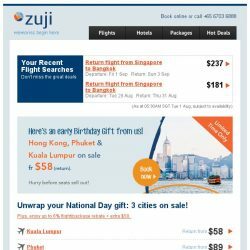 [Zuji] The National Day Sale begins! Fly fr $58 (return). 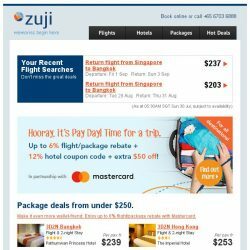 [Zuji] Pay Day Happiness: 3D2N Bangkok, Bali fr $239 (all-in)! 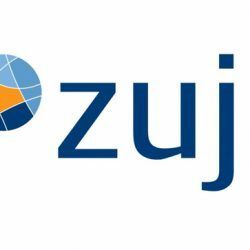 [Zuji] Last day! Fly SQ to Bangkok, Hong Kong and more fr $212. [Zuji] Don’t miss out! Singapore Airlines sale + $15 coupon code. 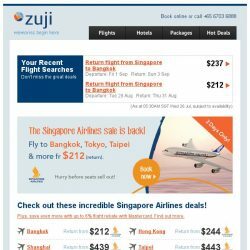 [Zuji] All Singapore Airlines flights on sale! Fly fr $212 (return). 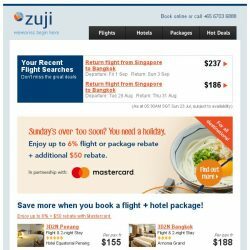 [Zuji] Extra savings with Mastercard! 6% rebate + 12% hotel coupon code. 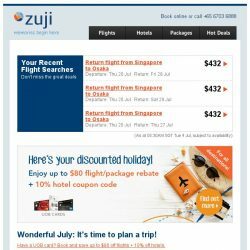 [Zuji] 4D3N packages to Tokyo and more fr $605! 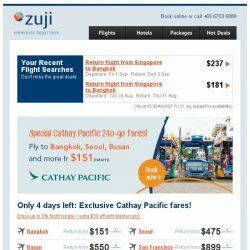 [Zuji] Cathay Pacific sale is back! Bangkok, Seoul fr $151. 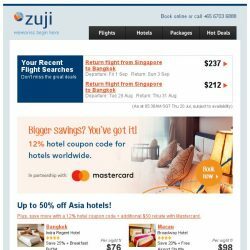 [Zuji] Up to 50% off Asia hotels! Plus, 12% hotel coupon code. 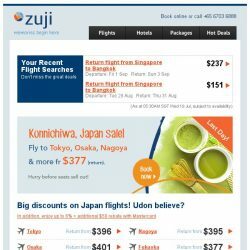 [Zuji] 72-hour sale: Fly to Japan fr $377 + extra $50 off. 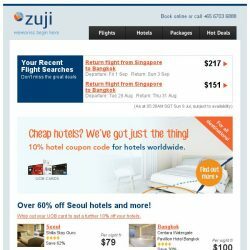 Book your hotel at ZUJI and enjoy additional 12% off with this coupon code! Pay via Mastercard to redeem during checkout. 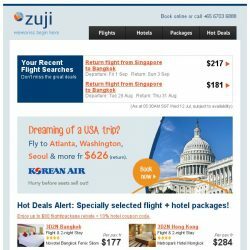 [Zuji] Hotels under $100 + extra 10% off! 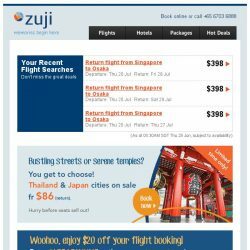 [Zuji] Bangkok, Tokyo and more fr $115 + up to $80 rebates. 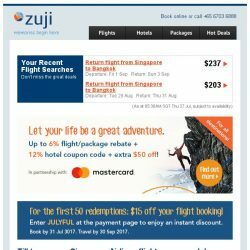 [Zuji] Exclusive $15 flight coupon code for you! For all cities. 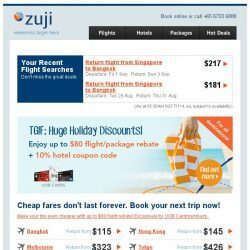 [Zuji] Flash sale + 3D2N Hong Kong and more fr $177. 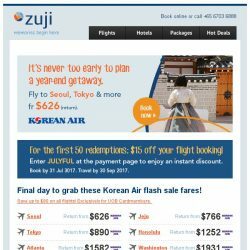 [Zuji] Korean Air SALE: Seoul, Tokyo & more on sale! 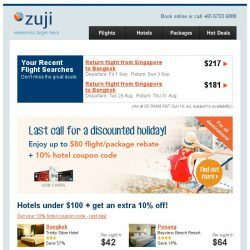 [Zuji] Extra 10% off Bangkok hotels and more! [Zuji] Last day! 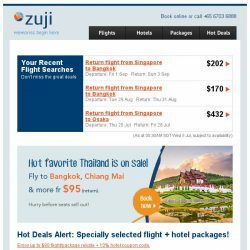 Bangkok, Phuket and more fr $89 (return). 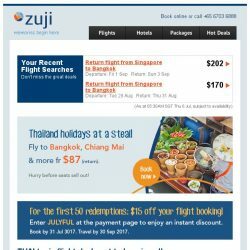 [Zuji] Fly to Thailand fr $87 + up to $80 off flash sale fares! 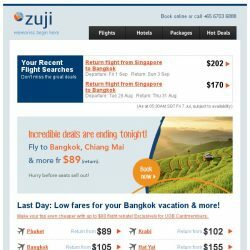 [Zuji] It’s Thailand on sale this week! 3D2N fr $153. 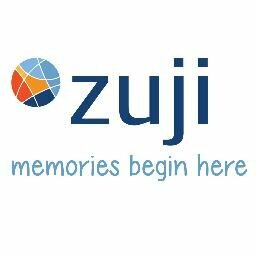 [Zuji] Rejoice, UOB Cardmembers! Up to $80 off flights. 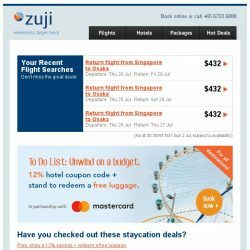 [Zuji] Staycation deals fr $128 + 12% hotel coupon code. 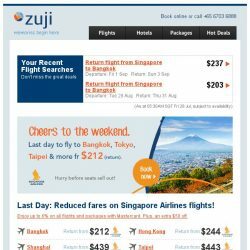 [Zuji] Last day! 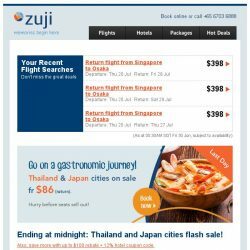 Bangkok, Phuket, Tokyo and more fr $86. 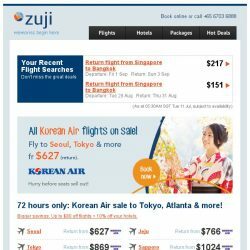 [Zuji] You deserve this flight promo code.